Click image for an archive of Clarion from 2002 to January 2011. Click image for an archive of This Week from 3/12/07 to 1/24/11. This website is a PSC archive. It is essentially the old website, frozen in time on Thursday, January 27, 2011. Everything on the site that day (with the exception of this home page) has been preserved. Clarion, the PSC's monthly newspaper, from 2002 to January 2011. 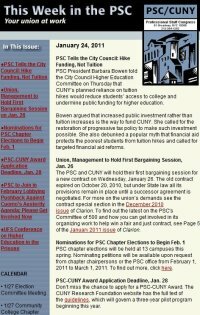 This Week, the PSC's weekly e-newsletter, from its inception, March 12, 2007, to January 24, 2011. For the Clarion and This Week -- and much more from January 28, 2011 forward, go to the current site.